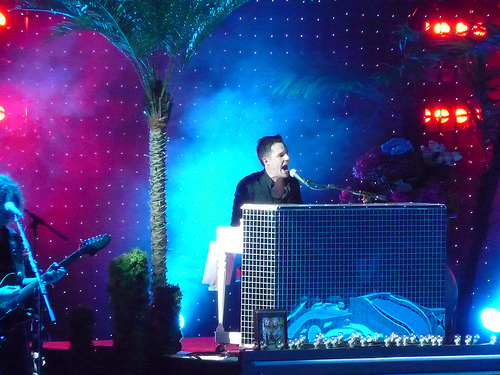 Suffice it to say: The Killers are a Great Band that plays a Great Show. I just wish I could say that each album they put out was as good as their blockbuster Hot Fuss and its sophomore follow-up Sam’s Town. Day & Age just isn’t as good, and it showed last night at their show in Fairfax at the Patriot Center. Aside from top singles Human and Spaceman, the rest of Day & Age fell flat in front of the crowd. While better live than memorex, it was tough to see the band that rocked out so hard on previous albums watch the crowd ebb in front of their eyes. Perhaps it’s that the sound wasn’t all that great in the Patriot Center (and it wasn’t, the engineering team needs to go back to school, there was some real balance programs for the whole first half of the concert. ), or maybe it’s that the source material for Day & Age just hasn’t gelled yet. Regardless, the crowd came most alive for the partially acoustic version of Sam’s Town, which was a highlight of the show. The lights & set at the show were, as you’d expect from a Las Vegas band, amazing. Sure, some of it could’ve been called seizure-inducing, but overall the effects were incredible. Chief among them, and the highlight of the night, was the LED Matrix behind the band. Made up of probably a thousand or so 8 bit LEDs in an evenly spaced grid, it turned into a giant low-res image screen. It was used with absolutely brilliant effect for the cover of Joy Division’s Shadowplay while scenes from 2007′s Control played behind them. No spotlights, no lights on the stage, they played Shadowplay in the dark on the stage while the images of Sam Riley’s Ian Curtis played on the LED matrix. It was a great homage to Curtis and Joy Division, while still rocking the hell out of the song. The whole set tonight was uneven. 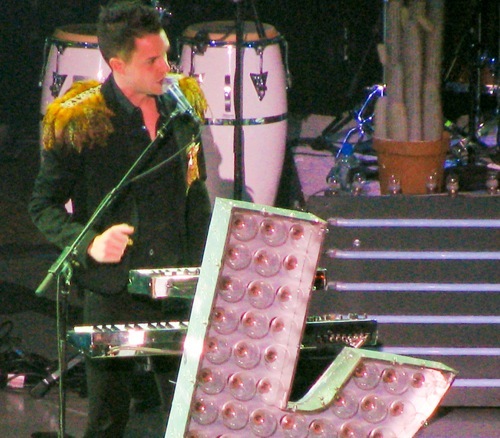 Between the song problems, and the lack of audience response to the newer songs (especially Neon Tiger, which went over like so many lead balloons, at least in our section,) it was a hard show to evaluate. Crowd favorites like Mr. Brightside, Read My Mind and their other earlier material was quite well done, but the mix of the new and the old was jarring in places, and it sapped the energy of the crowd. Postscript: I know, the photos in this piece aren’t from the show at the Patriot Center. I had called ahead to the facilities office to see what the restrictions were for the show, and I was told that personal cameras were just fine, but no professional photographers. I asked for clarification, mentioning that I had an SLR camera, and I was told it was no problem. Imagine my surprise when the security at the door turned me away for having an SLR. It’s obnoxious for the line to be drawn between little point and shoot cameras and cameras with dials and knobs and require some sophistication on the part of the user. It was more annoying, though, to have called ahead for information and been given the wrong information. If your delineation is going to be such that there’s an arbitrary line drawn: teach your staff how to answer questions about it properly when people call ahead. I was really ticked off when I couldn’t use my good camera to take shots, even if I was in the rafters section. Bummer about your camera. I’m glad I didn’t try to bring my SLR with me last night! We didn’t get a close parking spot, and I would’ve been pretty irritated if I had to trek back and forth two more times to put it back. AGREED that it’s ridiculous. Why doesn’t this band sing at least one ballad? While I agree that this band had energy, it seemed that it inspired human pogo sticks jumping up and down in one place. There are some benefits to repetition. There was a particularly large breasted female who bounced up and down and when she stopped, she quivered quite nicely. But you could have attached a metronome to her body as that was the same beat all night long.